Water-lover and river-enthusiast, Timothy's been paddling around Wisconsin and adjacent states since 2008. Always eager to explore the obscure, he's got a lot of wanderlust for secret places and memorable escapes (though sometimes that wanderlust gets him lost at night or capsized in winter). When not already on the water, Timothy is poring over maps to plan out his next trip, sometimes alone, sometimes with friends, sometimes in a solo canoe with his Boston Terrier. He has been a proud part of the MilesPaddled.com website since 2010, and his first paddling guidebook came out in August 2016, A native of suburban New Jersey (exit 159), he has gladly called the Upper Midwest home for half of his life now. From Lake Michigan to Minnesota, Interstate Highway 94 courses through the heart of Wisconsin and crosses over some of its most iconic rivers, such as the Milwaukee, Rock, Wisconsin, Black, Chippewa, and St. Croix. Come along for a fun and informative ride with local author and part of the MilesPaddled.com website, Timothy Bauer, as he shares his favorite trips and tips for paddling these sacred places along the "silk rowed" of the Badger State. Black River Falls, in west central Wisconsin, may well be the best kept secret in the paddling community: raging whitewater, gentle quietwater, squirrelly creek paddling, and gorgeous geology are just some of what defines this extraordinary recreation area. 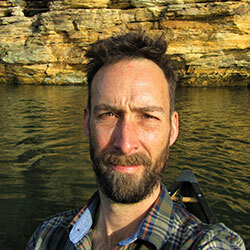 Come join local author and part of the MilesPaddled.com website, Timothy Bauer, for his tips on where and when to go, whether day-tripping, car camping, or paddling multi-night expeditions. With brief mentions of hiking, skiing, and mountain biking opportunities as well. After this, you'll want to become BFFs with BRF!